Developers are looking beyond congested, expensive cities to lure millennials and downsizing boomers. John Cole – The Daley apartment building, designed by KTGY Architecture + Planning, is the first phase in the Westside at Shady Grove community in Rockville, Md., near Washington, D.C.
Two decades after many millennials started moving downtown to be near their jobs, developers mastered what was needed to entice new urban dwellers: a good location, transit, retail, and swank multifamily buildings with amenities. Over time, all the development led to congestion and fewer affordable, close-in buildable sites. Apartment and condominium buildings became expensive for many. Developers and millennials alike asked the next question: Where now? The answer was to look at suburban sites that were still available and affordable. And although many millennials avoided migrating to the suburbs as many of their parents had, they began to view the trek as palatable, if enough stars aligned: more square footage, outdoor space, walkable neighborhoods, good schools (for those who had children), and the same amenities once only available in cities and smaller metropolitan areas, says Mary Cook, a commercial interior designer and founder of Chicago-based Mary Cook Associates. If their friends were willing to move, all the better. “Few want to move to the suburbs alone,” she says. Though the emerging suburban hubs may never have the plethora of attractions that urban downtowns do, many have enough “pockets of urbanity” to make a dynamic, live/work/play life possible, says architect Joshua Zinder, of Princeton, N.J.–based firm JZA+D. “They’re never going to resemble Los Angeles or other cities that big, but they can be pedestrian-friendly environments with enough going on,” says Jose Sanchez, DLR Group’s design lead focused on retail and mixed-use, who works in the firm’s Los Angeles office. The phenomenon of a suburban locale with urban vibe earned the moniker “surban” from Irvine, Calif.–based John Burns Real Estate Consulting. As these sub-hubs multiply across the country, what’s clear is that no single prototype will work since suburbs vary from tiny communities with a single stoplight to large ones considered small cities. Yet, the locations most likely to thrive share the common denominator of being hybrids that borrow some parts from their lively urban counterparts and retain their bucolic and other suburban advantages. To achieve this mix, developers are wise to heed the following seven lessons. 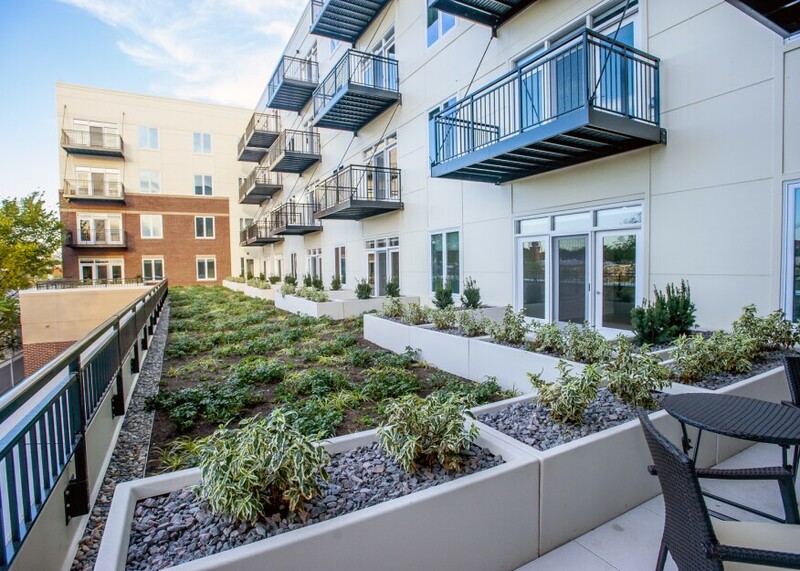 Courtesy M&R Development – Located in Illinois, the Residences of Wilmette, which features a green roof with drought-resistant plants, recently received LEED Gold certification from the USGBC. 1. Determine your demographic. Suburban multifamily dwellings attract residents for varied reasons. Most millennials want costs lower than in comparable urban buildings. “When they move, it’s typically because they were pushed out of where they like to live,” says Todd Zimmerman, a partner at Zimmerman/Volk Associates, a market analysis firm for urban and new urban communities in Clinton, N.J. But suburbs can be vastly different, so research and planning are needed to know who might find each appealing, along with which multifamily building. For example, Tony Rossi, president of Chicago-based M&R Development and chairman of RMK Management, felt his firm’s luxury apartment product would appeal to a new generation of renters-by-choice moving to affluent suburbs. “We’re experiencing a wave of empty-nesters who sold their homes and wanted to downsize in style, yet remain in their suburb,” he says. “There’s also more traction among maturing millennials decamping from urban centers to try out suburbs with good schools before they commit to raising a family. They’ve been living in class A apartments downtown and expect the same level of amenities, finishes, and service in a suburban rental, but with lower rents,” he says. The firm found the right type of site in the older, tony North Shore suburb of Wilmette along Lake Michigan. The five-story The Residences of Wilmette building it constructed became the area’s first new multifamily dwelling in more than a decade when it opened in 2017. M&R gave the brick and stone building a modern profile, a look many apartment renters now seek. The 75 high-end apartments have condominium-quality finishes and family-size units (up to three bedrooms, though there are studios for the fast-growing single-household rental market). The building also includes 116 parking spaces—1.54 per unit—landscaped terraces and an indoor fitness center and spa. It’s 93% occupied, and a two-bedroom, two-bathroom unit goes for $3,400, versus $3,500 to $3,800 for a comparable downtown building, Rossi says. Though CA Residential, the residential development arm of Chicago-based CA Ventures, often designs luxury downtown properties, it’s now also looking for suburban pockets with a higher-than-average concentration of “gray-collar” renters whose household income and education levels and population growth exceed national norms, says Bob Flannery, president. The company designs these apartments in affordable location with larger floor plans; market-appropriate finishes, services, and amenities; and costs lower than similar higher-end suburban properties and urban developments. Projects in Lacey, Wash., Thornton, Colo., and Vallejo, Calif., are in its 2019 pipeline. The one cohort that may be less interested in the surban model are families with children. “They still gravitate to single-family homes because they’re interested in family-friendly activities,” says Steve Burch, senior vice president, consulting, in the Phoenix office at John Burns Real Estate. 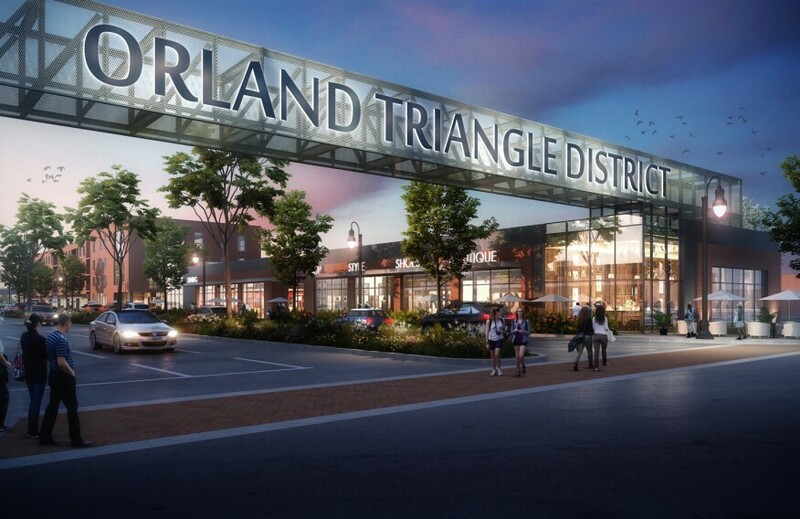 Structured Development will develop the final 9 acres of the 27-acre Triangle in Orland Park, Ill.—a mixed-use master plan adjacent to the Chicago suburb’s Metra station with an urban style that helps establish a gateway to the village. 2. Locate near jobs and transportation. Nearby employment for residents can be a strong incentive for developers when picking one suburban site versus another. But there needs to be some form of mass transit or highway network to get residents to them. David Schwartz, chairman of Waterton, a Chicago-based firm focused on acquisitions, says he’s most keen on properties that offer easy access, followed by those with good retail, then amenities. The NRP Group, a vertically integrated developer based in Cleveland, recently broke ground on The Rockwell, an upscale multifamily apartment building planned for a 2021 opening in Berlin, Mass., because of both jobs and access. The location lies 35 miles west of Boston but is also a short drive from major interstates. And more potential jobs will develop outside the 204-unit garden-style residents’ doors as Riverbridge Village, the mixed-use master plan community it’s a part of, moves forward with a hotel, day care, wine store, coffee shop, and gas station. These days a transit-oriented site can be a huge incentive. The Bozzuto Group and The Chevy Chase Land Co. broke ground in December to develop Chevy Chase Lake, a mixed-use, transit-oriented community in the Maryland suburb of Chevy Chase, just outside Washington, D.C. In addition to attracting renters, the under-construction Purple Line extension of the Metro “allowed our firm to increase the buildings’ density,” says Toby Bozzuto, president and CEO of the Greenbelt, Md., company. “The Purple Line was not only complementary to our collective vision, but it was also additive in the sense that it provides even more conveniences for our residents and customers,” he says. In nearby Rockville, Md., Metro’s Red Line helped spur Bozzuto and EYA Communities to redevelop a 90-acre industrial park into Westside at Shady Grove Metro, which will be a 1,100-unit multifamily, mixed-use neighborhood. Phase one features retail and a 333-unit luxury building, The Daley at Shady Grove Metro. “The area was underutilized with a gap in its fabric. This project makes the disparate parts around it more walkable,” says Benjamin Kasdan, associate principal at KTGY Architecture + Planning, which worked on the design. “The ultimate goal is to create a significant-sized town center where each phase will add (to it),” adds KTGY principal Kamran Charmsaz. Robert Benson – DiMella Shaffer designed Fuse Cambridge in Massachusetts with more bicycle parking than car storage. 3. Solve the car challenge. Cars may have become less important with fewer 16-to-19-year-olds getting their driver’s licenses, but many moving into suburban multifamily buildings aren’t yet ready to give them up completely. So, the challenge for developers is how to provide parking and keep rental and sales prices lower than in urban downtowns. “Structured garages usually bring little return, if any,” says Samuel M. Luckino, a principal at the Chicago firm Goettsch Partners. “While the intent of a live/work/play community is to eliminate as much parking as possible—and this is starting to happen—it’s a long way off,” he says. On average, suburban buildings require more parking spaces per unit—1.5 to 2 spaces versus 0 to less than 1 for their urban counterparts, says Marc A. Moura, senior associate, director of design at Amenta Emma Architects in Hartford, Conn. “This is not just a zoning requirement but a marketing requirement,” he says. The good news, Bozzuto says, is that his firm is designing less parking per building than it did five years ago. Many developers’ solution is to offer only surface parking, sometimes covered, rather than more expensive underground spots. “There’s a big cost differential between above and below grade,” says Bryan Oos, vice president of development for Toll Brothers Apartment Living, headquartered in Horsham, Pa. To lower costs for a new-construction multifamily project in the west suburbs of Houston, where cars are still necessary, Origin Investments, a private equity real estate firm that develops, owns, and operates multifamily buildings nationally, carefully selected a full-service local contractor as investment partner, which helped lower costs, says Origin partner’s co-founder David Scherer. Many developers see bicycles as one solution. 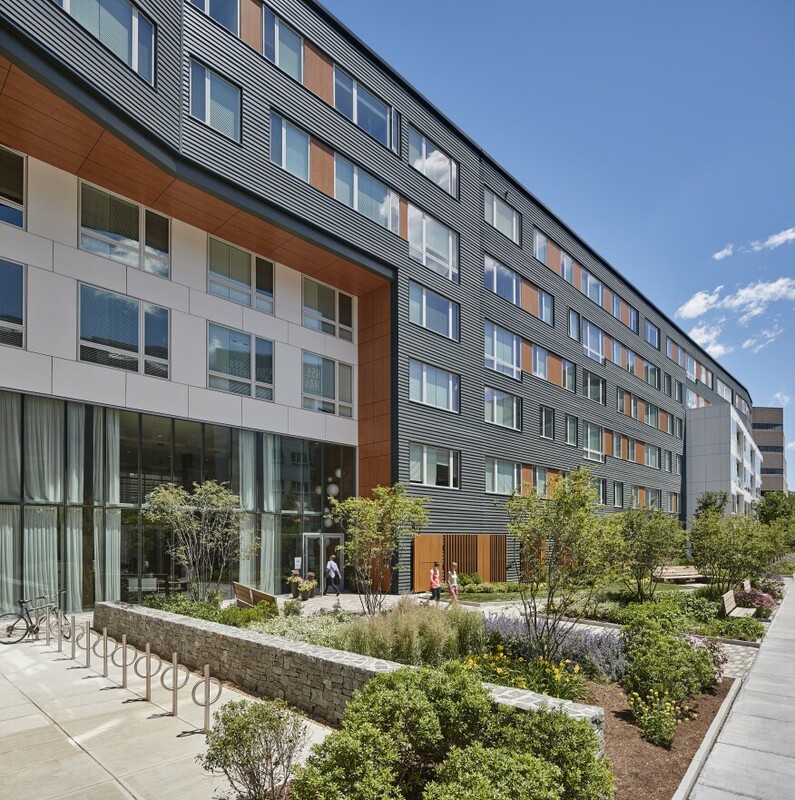 Moura’s firm included a bike-sharing program on a multifamily project in West Hartford, Conn., and Boston-based architecture firm DiMella Shaffer’s Fuse project in Cambridge, Mass., has more bicycle parking than car storage. The good news is that the new status symbol for some is not to own a car, says Robert J. Gibbs, president, Gibbs Planning Group in suburban Detroit. 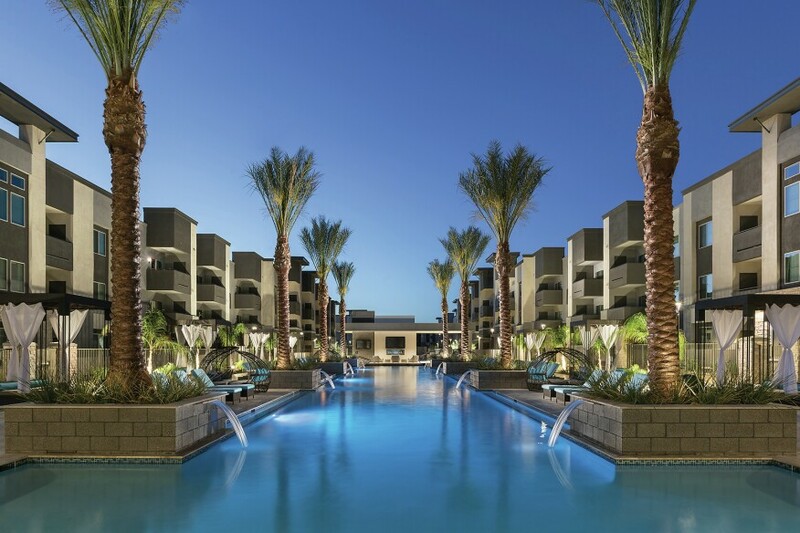 Courtesy Housing Trust Group – The suburban luxury Aviva apartments in Mesa, Ariz., are packed with amenities for downsizing boomers and millennials coming for tech jobs. Features include one of Arizona’s largest pools. 4. Cooperate with municipal leaders. The process of building in suburban and exurban areas can be more challenging than in urban areas and take longer, says Moura. “It can be difficult to conform to zoning laws, and often times variances must be sought to allow buildings to be taller and accommodate more greenspace and parking,” he says. In addition, there may be public outcry against taller buildings. His advice is for developers and architects to have a good neighborhood outreach program that starts early to build trust within the community as well as to be able to show clear, attractive renderings of buildings to illustrate how they fit within their context. In many areas, it’s the municipal leaders who have begun to take the lead to attract development that adds to their revenue and population base. Richmond, Va., which experienced a boom in millennials moving downtown after 2010, is now seeing a swing back to the suburbs, says Jeff Geiger, a partner in the real estate development and land use and zoning practice at Hirschler, a local law firm. Good infrastructure was already in place in Richmond’s suburban counties like Henrico County, he says. But to attract mixed-use, multifamily development, the suburban counties recognized that traditional policies and approaches to land planning needed to adjust. Rather than create big urban-like downtown cores in various suburbs, the goal was to fashion compact, pedestrian-focused projects along existing corridors to stimulate development and rejuvenation that takes advantage of existing infrastructure, Geiger says. The suburban town of Harrison, N.Y., in Westchester County, north of New York City, also took steps as it witnessed office buildings become vacant and tax revenue decline in an area known as the “Platinum Mile,” bounded by three highways. “We organized a lunch and asked what everyone needed so we could develop a new master plan that would encourage development,” says mayor Ron Belmont. The result is an ongoing renaissance with varied uses, including a 200,000-square-foot Life Time Fitness gym and Memorial Sloan Kettering Cancer Center, and construction on Toll Brothers’ 421-unit, five-story apartment building, the Carraway, on a 10-acre site where two buildings once stood. The county’s first Wegmans supermarket will be about 300 feet from Carraway’s door when completed next year. Besides the major roadways, there’s also an Amtrak train line into Manhattan in White Plains, the county seat 3 miles away, and a county-owned bus network. Jeff Stikemann/Courtesy Amenta Emma – One Park Road in West Hartford, Conn., designed by Amenta Emma Architects will update and add to a convent, chapel, and administrative buildings. 5. Incorporate dynamic visual rhythm. Almost 60 years ago, urban activist Jane Jacobs authored The Death and Life of Great American Cities and shared that cities come to life because of their dense, mixed-use surroundings. But such varied development has never sprung up overnight. That was certainly true of the original post-World War I suburbs in the 1920s, says architect and neighborhood planner, Steve Mouzon, co-founder with wife, Wanda, of Mouzon Design in Miami Beach, Fla. But in contrast, many new surbans lack the same vibrant authenticity because of their almost-instant growth. One way to achieve authenticity is for municipalities to require that more than one firm develop buildings in an area. “Many hands over time create a more interesting design,” says Mouzon, a fan of the Incremental Development Alliance, a nonprofit virtual organization that advocates helping entrepreneurs and civic leaders to strengthen neighborhoods through small-scale real estate projects. Another is to incorporate existing buildings that can be repurposed rather than razed to add patina. Amenta Emma Architects’ multifamily project in West Hartford will transform a 1913 convent with large windows and high ceilings, a 1941 administrative building, and a 1962 chapel into a complex with desired amenities such as a pet spa and golf simulator room. John Cole – Bozzuto’s Daley apartment building in Rockville, Md., is located in a walkable community close to transportation, dining, retail, and outdoor recreation. 6. Don’t forget retail. Along with residents and offices, retail becomes another catalyst. “Simply put, retail and office will fail without residents, and residents will not stay or come without retail or office. This may seem obvious but even urban areas fail at this aspect when transitioning neighborhoods,” Luckino says. In fact, everything should be close by. Scherer says multifamily buildings should be no more than five minutes from coffee bars, grocery stores, and entertainment, while Zinder recommends grab-and-go kiosks that operate after hours. Such features do more. They have been shown to encourage people to walk farther, which is a health benefit, says Mouzon. And they add a direct economic win for developers, says Gibbs. “Apartments generally rent for 12% more if a coffee shop or green grocery like a Whole Foods is located within a 10-minute walk,” he says. But attracting retail to the suburbs, especially in the current environment, is far from easy, says Jeff Berta, senior director of real estate for Structured Development, a Chicago-based real estate development company. The answer for both suburbs—as well as cities, even large ones—may lie in seeking retailers that have learned the importance of experiential features that consumers seem to find more relevant rather than stacks of merchandise. Entrepreneurial leaders like Apple are rolling out ideas such as workshops and classes. RKW Residential – Developed by Arnold Companies, the Residence at Old Hickory Lake in a suburb of Nashville features an eat/boat/live concept to promote the community’s location on the banks of Old Hickory Lake with neighboring marinas and a popular restaurant. 7. Include varied amenities. Amenities, which became associated with upscale urban multifamily buildings, are now almost de rigueur in suburban dwellings to attract a similar clientele. However, unlike many cities, surban sites often can turn natural features such as parks, lakes, and trails into amenities to convey the impression that the community isn’t just built around commercial uses but also has a heart, Luckino says. 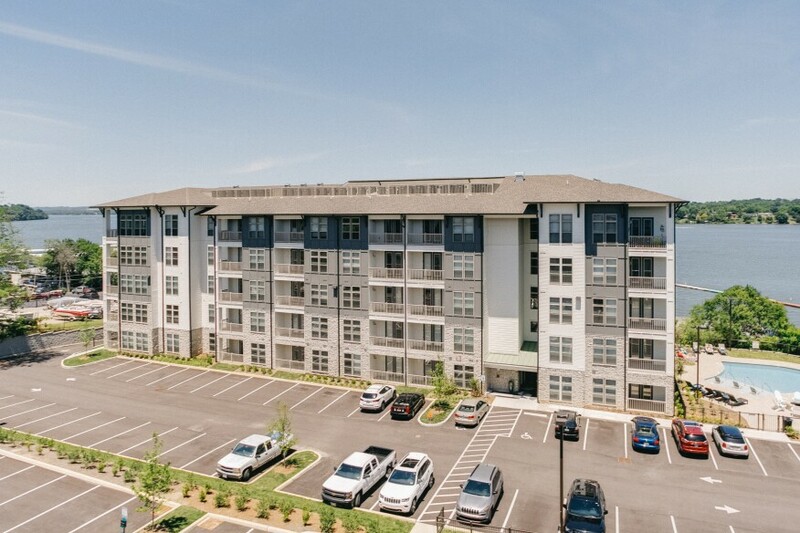 RKW Residential, a multifamily property management company headquartered in Charlotte, N.C., took this approach with an apartment building developed and owned by Arnold Companies in Columbia, S.C. The Residence at Old Hickory Lake in Old Hickory, Tenn., a Nashville suburb, features 116 units on the banks of Old Hickory Lake with the additional perks of a saltwater pool, grilling stations, and a fire pit, along with marinas and a popular restaurant that can be accessed from the water. For sites farther out, more amenities can be incorporated to encourage residents to enjoy staying put. That was the approach Housing Trust Group, a multifamily residential developer based in Coconut Grove, Fla., took when it developed the first in its new Aviva brand in Mesa, Ariz. President and CEO Matthew Rieger packed the three-story, 325-unit apartment building with sizzle for its prime targets—young professionals coming to the area’s hot tech job market, and seniors giving up large homes. Among its features: a 150-foot-long pool, a 120-inch screen for movie nights, 10 outdoor fitness stations, a 9,000-square-foot clubhouse, and co-working spaces. Opened in late 2018, the property is 98% occupied and had the company’s fastest lease up despite having Mesa’s highest-priced rents: One-bedroom units start at $1,121 and go up to $1,799 for three bedrooms. Another solution is to borrow from the urban playbook. Boston-area buildings are constructing decks atop rooftops, says architect Ed Hodges, with DiMella Shaffer, whose firm designed two such decks at the 40 Rugg Road building in Allston, Mass. “When people tour buildings with roof decks that’s what they seem to remember. They find them cool because of views and height,” says firm partner Frank Valdes.